Tonara has redefined the way musicians practice and perform. This review was contributed by Caleb Hsu, editor-in-chief of The Berklee Groove, and is not sponsored in any way. If you’re a piano player like myself, you understand the turmoil that arises when you’re playing a piece of music that contains more pages than can comfortably fit on a music stand. However, thanks to the crossroads where technology and business acumen meet, the days of clumsily fumbling through loose sheets of paper, making corner folds in attempts to more easily grasp and turn pages, and enlisting the help of an auxiliary page turner are all things of the past. 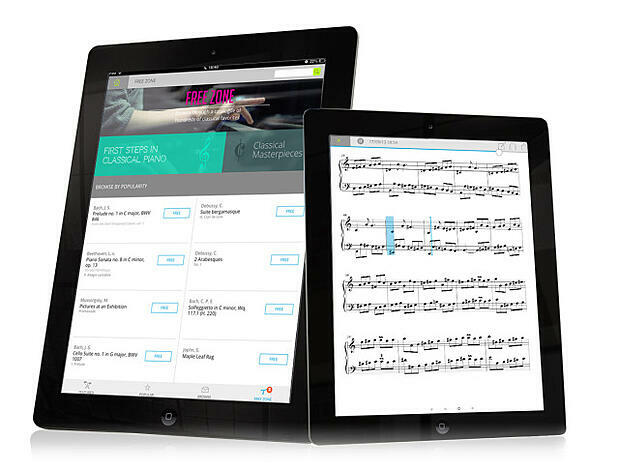 Created by an Israeli tech company, Tonara is the first among dozens of e-book style virtual sheet music apps to offer the ability to listen and follow your playing. This genius app records you as you play, showing where you are in the score and turning the page accordingly. Tonara hit the hammer on the string (so to speak) with this seemingly obvious advancement in utilizing the device’s built-in microphone to follow along with your playing. Tonara completely removes the hassle and guesswork from practicing and performing. Without the need to mark down tempos and awkwardly shuffle between pages, there’s no interruption of the creative musical flow that occurs during practice hours — and ultimately, in performances. Tonara completely removes the hassle and guesswork from practicing and performing. Technological innovation is all about streamlining. Why have five separate devices when one could make the rest obsolete (e.g. the iPhone)? Competitor PageFlip attempts the same thing as Tonara, with a clunky yet programmable foot pedal to navigate from one page to the next. But who wants to buy an iPad, invest in a sheet music app, and then purchase a separate class-compliant controller just to play a piece of music? The makers of Tonara even went as far as enabling a Bluetooth connectivity option for users who prefer a hands-free, tactile control of page navigation that is compatible with external devices such as PageFlip pedals. Now that’s a company that truly caters to user preferences. Speaking of features and functionality, this app comes fully loaded. When an app has a beautifully designed layout, complete with accessible infographics and a smooth user interface, I’m instantly drawn to it. Tonara does just that, displaying detailed summaries of each practice session, including the amount of time spent (per page) and the number of pages that were played successfully. It also tracks your average tempo so you can gradually improve your reading and performance abilities in a structured way. The latest update allows for MIDI playback, which enables you to listen to the composition you’re playing. This is great for practicing — if you’re not sure how to play the music, the audio track will help you get the general idea and jumpstart the learning process. Additionally, there are promising “New Arrivals” and “Best Sellers” sections where you can find recently uploaded compositions and scores based on current trends. As a financially indebted college student, I highly appreciate seeing a “Free Zone” section, boasting a score catalog containing hundreds of classics. But the largesse doesn’t stop there: if you register, you’re eligible to download 10 free scores each week. Best of all, you can import your own existing PDF scores from the web or as an email attachment, or access them via a cloud account from within the app (such as Dropbox, Google Drive, and others). While there could be additional features beyond the follow-while-you-play functionality and effortless text input layers (such as transposition capability, for example), I love everything about Tonara. Oh, and it's completely free to download.